Welcome to the Weeds and Rabbits Project’s October newsletter. As we approach the two-year mark of the project, we’re seeing the collective impacts our grants are having on individuals, community and government working to build community-led rabbit and weed action. We’ve also recently delivered an innovative program on community leadership, and new opportunities are available over the coming months. Read on for updates on all of this. Feel free to share this newsletter with your own networks – new readers can subscribe via the link at the end of this newsletter or by emailing pestanimalsandweeds@ecodev.vic.gov.au. Post-fire blackberries: With the support of the Victorian Blackberry Taskforce, community members and their local council are coming together to control blackberry on their own terms post-bushfires. Watch this video on their story. A community engagement course with a difference has helped build new skills and networks for supporting community-led management of weeds and pests. The Master Class in Leadership for Community Engagement brought together 23 aspiring community engagement leaders, representing Landcare, government agencies, local councils, industry and community groups. Instead of following a step-by-step engagement framework, the Master Class encouraged participants to consider how they could advocate for a stronger voice for the community in the planning and delivery of weed and pest management. The program highlighted the importance of investing in relationships within the community to build trust. For many participants, this was a shift away from the more traditional approach of coming up with a project idea and then ‘engaging’ the community to help ‘deliver it’. It also highlighted that ‘outputs’ such as hectares of control undertaken, number of trees planted, or number of people ‘engaged’ are not always reliable indicators of success for either projects or communities. The Master Class is the Weeds and Rabbits Project’s major community leadership program. It was facilitated by Professor Ted Alter from Penn State University and Dr Tanya Howard from University of New England. If you missed out on this opportunity and are keen to build your community engagement skills, read on below for details of an upcoming program. Image: Participants at the Master Class on Leadership for Community Engagement, held at Macedon in September 2018. Are you interested in serrated tussock control and looking to develop your community engagement practices? Apply now for this free workshop, hosted by Victorian Serrated Tussock Working Party (VSTWP). You will need to be interested in connecting with others to share your knowledge and experience of what is going well and the issues you face, in a professionally-facilitated, peer-based learning environment. Fifteen places are available. Applications are welcomed from community members, volunteers and professionals involved in serrated tussock management, whether through a community or farming group, Landcare, government agency, Catchment Management Authority, or any other organisation with land management responsibilities. Applications close 5 November. Find out more at the VSTWP website. Northern Bendigo Landcare Group have a long-term vision of a rabbit-free environment along Bendigo Creek. To help them achieve this, the Northern Bendigo Landcare Group (NBLG) received a Victorian Rabbit Action Network (VRAN) grant to fund an awareness-raising event for community members. The resulting rabbit control workshop was oversubscribed, with more than 70 people coming along to hear guest presentations from Neil Devanny (rabbit management mentor from VRAN), Peter West (RabbitScan program leader from the Department of Primary Industries NSW) and Ben Perry (Biosecurity Officer from Agriculture Victoria). The guest speakers shared their knowledge on best-practice rabbit control methods, monitoring rabbit populations, and the new rabbit biocontrol virus RHDV K5. Field demonstrations were provided by Bendigo local and NBLG member, Jason Coulson, who has undertaken rabbit control training with through VRAN. Participants included local landholders, TAFE students, Landcarers, and staff from Coliban Water, City of Greater Bendigo, Fosterville Gold Mine, Loddon Mallee Heritage, Parks Victoria and Agriculture Victoria. Many attendees shared the Landcare vision of a rabbit-free environment along Bendigo Creek, and are keen to volunteer for the NBLG’s future rabbit control programs. VRAN provides support for the many communities proactively working together to solve their rabbit issues. VRAN’s Community Action Grant funding has helped 10 community groups to raise awareness about rabbit issues in Victoria and support community-led action during 2017-2018. 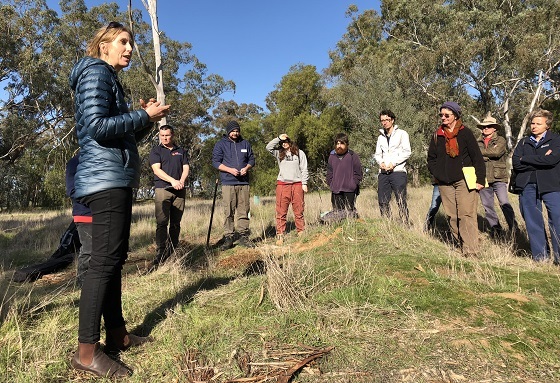 Image: Nicole Howie, Secretary of the Northern Bendigo Landcare Group, with participants at the Bendigo Creek rabbit workshop. An innovative social science project has delved into one of the biggest issues plaguing community pest management: how to motivate disengaged landowners. Funded by the VSTWP through the Weeds and Rabbits Project, it focused on understanding the mindset of "don't know/don't care" landowners. The research considered different types of landowners and the values that would be most likely to drive or hinder weed control. Community Engagement Officer at VSTWP, Ivan Carter, said the findings were transferable to many environmental issues and challenges. A report on the project is available on the VSTWP website. Image: VSTWP Extension Officer Ivan Carter with community members at a recent field day. Both the VSTWP and the VGT are holding their Annual General Meetings in November and seeking new committee members (particularly in western Victoria for serrated tussock). If you’re passionate about weed control and supporting local community action, visit the VGT or VSTWP to find out more. Image: VGT Committee member Karen O’Keefe representing the VGT at Sheepvention in Hamilton. Research funded by the VBT through the Weeds and Rabbits Project has successfully produced a diagnostic tool for purple blotch disease (PBD) Septocyta detection. It is a systemic disease with the potential to suppress blackberry over large areas of public land, private native forest and within the plantation estate. It is very difficult to distinguish the PBD pathogen from others that affect blackberry. Previously, if Septocyta was detected in a commercial berry farm there was no way of quickly identifying the strain. It is important that identification is timely as one strain, Septocyta rubrorum, which is not known to be in Australia, will cause the death of the plant. The next step will be to engage with rubus growers to inform them of the application of this technology on commercial crops. 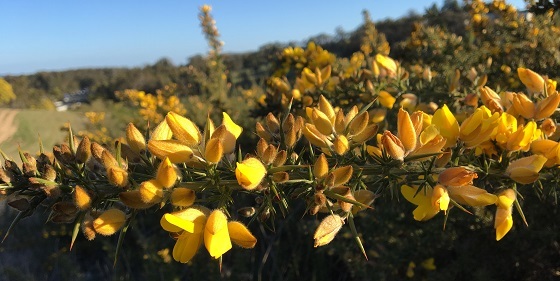 More support is now available for communities affected by gorse in the Bellarine and Hepburn regions, thanks for the Victorian Gorse Taskforce’s (VGT) new extension and engagement project, with tailored best-practice gorse management advice now being offered to support a community-led approach. Landholders can contact Heidi Snow to be part of the project: 0428 335 705. Extension and Communications Officer Heidi Snow will be attending various field days across the state promoting best-practice gorse control, including the Bairnsdale Show (10 November), Clunes Show (17 November), Yarram Show (24 November) and Kilmore Show (1 December). Following overwhelming interest in the 2018 Leadership in Rabbit Control Course, an additional training program for rabbit managers has been scheduled. Developed by the Victorian Rabbit Action Network (VRAN), the course is designed to support communities and agencies to be knowledgeable and capable to deal with rabbits wherever they occur in Victoria. This year will be the second time it has been delivered, with participants coming from community groups, industry and government agencies. What’s different about the VRAN course? It’s facilitated by VRAN mentors who are recognised experts in rabbit management and community-led action. As a group, they offer expertise and insights from community, industry and government perspectives. By the end of the course, participants understand the ecology and biology of rabbits, Victoria’s legislation framework and how to implement an integrated rabbit control program. They take part in demonstrations and learn how to plan and implement monitoring programs to maximise their control efforts. An additional (and critical) element is the opportunity to establish networks with others from across Victoria who are facing similar scenarios and issues with rabbit management and community action. Community members interested in applying for the 2019 course can contact VRAN Executive Officer Heidi Kleinert: heidi.kleinert@ecodev.vic.gov.au. A series of forums scheduled for early 2019 will demonstrate use of the citizen science mapping portal ‘Atlas of Living Australia’ for mapping invasive species distribution and planning control programs. Hosted by the VGT in partnership with local community groups, the forums will be spread geographically across Victoria to build capability, skills and confidence in wide range of communities. If you’re interested in attending, please contact Paige McDonald: info@vicgorsetaskforce.com.au. If you would like to subscribe to the Weeds and Rabbits project newsletter please subscribe online or email pestanimalsandweeds@ecodev.vic.gov.au. This newsletter is distributed by the Department of Economic Development, Jobs, Transport and Resources.